I must cross the Grand River every day at least 6 times to or from home in Conestogo and often enjoy spying ducks, herons and other wildlife enjoying the water. Well today as I looked down off the bridge I saw something that almost made me drive into the guardrail. 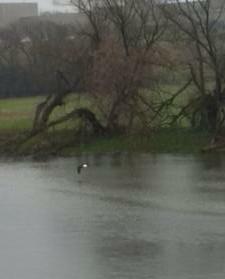 There was a huge Bald Eagle standing right in the middle of the river on a shallow shoal. I hit the brakes and jumped out to snap this photo. I must have startled him as he took off just as I set up for the shot. The white you see in the picture is actually his tail feathers, not his head. It was an amazing thing to see here in Waterloo. Thank you for sending this to us, Jeff! 31 January 2015: Adult M/F pair of American Bald Eagles perched in a tree alongside the Conestogo River, at Northfield Drive, Waterloo. Hi Jeff! I had the same thing happen to me in Plattsville, Ontario. I was crossing a river and saw a Bald Eagle standing on a little island. I parked as quickly as I could and tried to get a picture. When he spotted me he flew further away with a huge fish in his talons. I was in awe!